Natalie Clem graduated from Smith College in Northampton, Mass., with a bachelor's degree in biological sciences and philosophy. She has been writing on health and science topics since 2004. 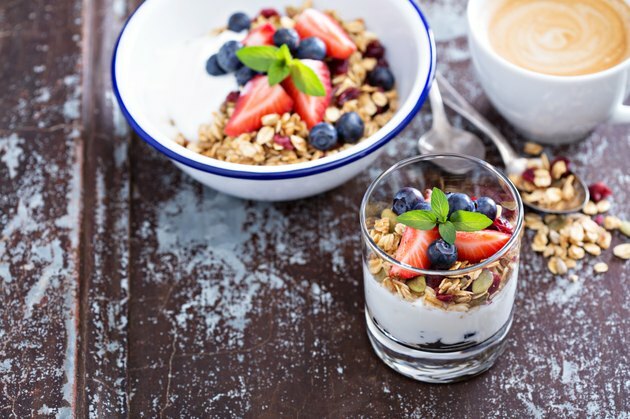 The French word for perfect is parfait, and when you add whole grains and fruit to yogurt to create a delicious breakfast or snack treat, you are perfecting yogurt's already considerable health benefits. Typically, a yogurt parfait consists of layers of yogurt, grains such as granola or crushed gram crackers and fruit. When the fat and calories are low, it can be a healthful choice at fast-food restaurants and coffeehouses. When not loaded with additional sugar, low-fat or fat-free versions of yogurt are an excellent source of protein, calcium, and probiotics, which are microorganisms that help keep the digestive system working properly, according to information published by the Michigan State University. Fruit imparts a vitamin-rich and naturally sweet characteristic to your yogurt parfait. The U.S. Department of Agriculture recommends that you eat two cups of fruit a day, and a parfait will get you on your way to fulfilling that recommendation. The Harvard School of Public Health says diets rich in fruits and vegetables lower blood pressure and reduce risks of heart disease, strokes, some cancers and some eye problems. According to Familydoctor.org, the healthiest grains to use are oatmeal, low-fat granola or crushed crackers. These grains are healthiest because they are rich in complex carbohydrates, which regulate your digestive system and your blood sugar levels. Much of the dish's health benefits come from how completely customizable it is, with your choice of yogurt, grain and fruit. Take a cue from the Cleveland Clinic, which recommends adding some slivered nuts, wheat germ or ground flax seeds to add heart-healthy omega-3s and fiber that will keep your digestive system in good shape. Yogurt parfaits are healthy partially because they are so easy to make. If you're in a hurry, throw in some blueberries or raspberries that don't need to be sliced. You can also add easy extras that maximize a yogurt parfait's health benefits. Drizzle some raw local honey between the parfait's layers. Not only will it add sweet flavor, the 2012 issue of "Evidence Based Complementary and Alternative Medicine" reports honey will boost your immune system and help reduce inflammation throughout your body. Sprinkle some cinnamon to top off your parfait's healthfulness. A study in the March 2009 "American Journal of Clinical Nutrition" found that cinnamon lowers the rise in blood sugar levels following a meal. One of the key benefits to a yogurt parfait is that it provides an easy to make or purchase a portable and, most importantly, balanced small meal. A meal composed of all the major food categories -- protein, carbohydrates and a small amount of fat -- allows your body to take full advantage of the nutrients provided by each type of food. At a fast-food restaurant or coffeehouse, a parfait seems like a healthy and appetizing option. Before you make your decision, though, take a few seconds to analyze the calorie and fat information on the parfait, which should be located either on the menu or on the ready-made parfait's label. The American Heart Association calculates that with a typical 2,000-calorie-a-day diet, you should ingest no more than 56 to 77 grams of fat a day. Keep in mind that breakfast should account for a little less than a third of your total daily intake of calories and fat. What Can You Put in Yogurt? How Many Calories in a Bowl of Special K?